troops. It has responded, as Matt Kennardâ€™s explosive investigative report makes clear, by opening its doors to neo-Nazis, white supremacists, gang members, criminals of all stripes, the overweight, and the mentally ill. Based on several years of reporting, Irregular Army includes extensive interviews with extremist veterans and leaders of far-right hate groupsâ€”who spoke openly of their eagerness to have their followers acquire military training for a coming domestic race war. As a report commissioned by the Department of Defense itself put it, â€œEffectively, the military has a â€˜donâ€™t ask, donâ€™t tellâ€™ policy pertaining to extremism.â€Irregular Army connects some of the War on Terrorâ€™s worst crimes to this opening-up of the US military. 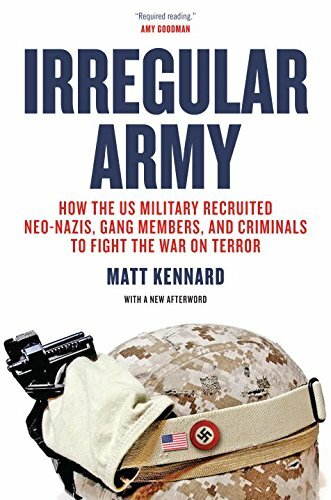 With millions of veterans now back in the US and domestic extremism on the rise, Kennardâ€™s book is a stark warning about potential dangers facing Americansâ€”from their own soldiers.